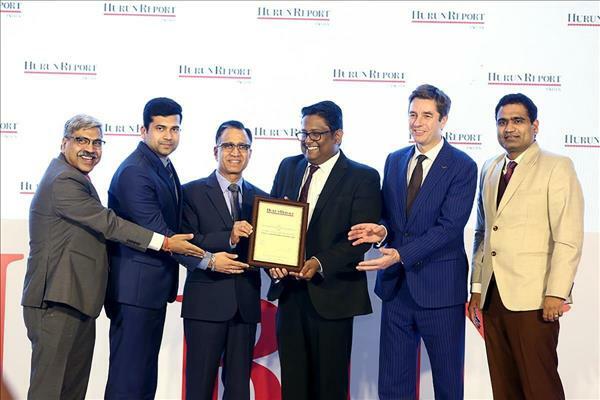 (MENAFN - ForPressRelease) Kalyan Jewellers, one of Indias largest and most trusted jewellery brands has been honoured with the Hurun Industry Achievement Award 2018 in the Jewellery category. The award was presented to Mr. T.S Kalyanaraman, CMD, Kalyan Jewellers at the Barclays Hurun Most Respected Entrepreneur Award Ceremony held in Mumbai. The Hurun Industry Achievement Award 2018 is the highest pan-India award in the Jewellery industry and has been awarded to Kalyan Jewellers for its contribution to the economy, ethical conduct in doing business, and respect attained in the industry. Kalyan Jewellers, one of the leading jewellery brands, recently completed 25 years in India. Starting with a single showroom in 1993, the brands footprint today extends to 135 showrooms across India as well as in the GCC (Gulf Cooperation Council) in UAE, Qatar, Oman and Kuwait. The brand also has an online presence through Candere, its online jewellery portal. Over the years, Kalyan Jewellers has set industry benchmarks with a customer-centric model that focuses on integrity, trust, quality, transparency and innovation. In 2018, Kalyan Jewellers have expanded the brands footprint in North and Central India with new showrooms in Jharkhand, Chhattisgarh and Assam. Mr. T S Kalyanaraman, Chairman and Managing Director, Kalyan Jewellers said, We are extremely delighted and honoured to receive this recognition which acknowledges our efforts to build Kalyan Jewellers into a leading Indian jewellery retail brand. It is their trust which drives us to continue on our growth path. Our customers are part of the Kalyan Jewellers family and our endeavour is to always provide them a great personalized shopping experience. We are happy that the award also recognizes our philanthropy initiatives. Kalyan Jewellers has actively supported various CSR projects in 2018. These include supporting Habitat for Humanity in their project to build houses for marginalized families in various states across India, as well as contributing towards various philanthropic activities like building hospitals, medical assistance and education in alignment with the Government of Indias Housing for All and Swachh Bharat Abhiyan schemes. Kalyan Jewellers also launched the Do More for Kerala initiative to support the rehabilitation efforts during Kerala floods this year, and contributed to the Chief Ministers Distress Relief Fund.